“Today marks another milestone in the development of a whole new scientific paradigm for the treatment of serious diseases. In just several decades, gene therapy has gone from being a promising concept to a practical solution to deadly and largely untreatable forms of cancer,”6 said FDA Commissioner Scott Gottlieb, MD. With its FDA approval, axicabtagene ciloleucel became only the second gene therapy to be approved in the United States and the first CAR T-cell/gene therapy to be approved for the treatment of adults with several types of relapsed or refractory large B-cell lymphoma. 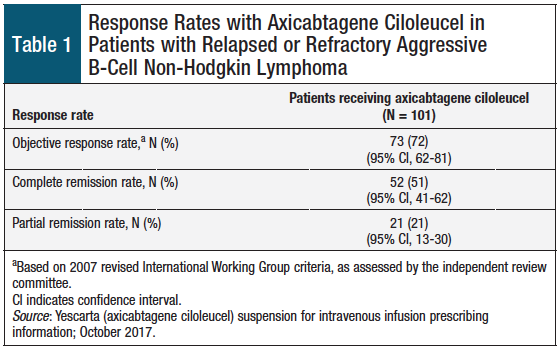 In the pivotal clinical trial YUMA-1, 72% of patients who received axicabtagene ciloleucel achieved an objective response, of whom 51% achieved a complete remission. 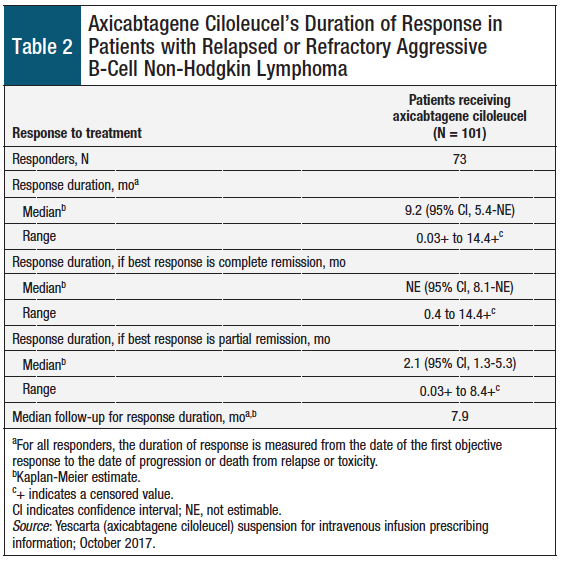 Axicabtagene ciloleucel, a CD19-directed CAR T-cell immunotherapy, is a new treatment option that may improve outcomes for patients with certain types of large B-cell lymphoma. 1. American Cancer Society. Types of non-Hodgkin lymphoma. www.cancer.org/cancer/non-hodgkin-lymphoma/about/types-of-non-hodgkin-lymphoma.html. Accessed December 7, 2017. 2. Mayo Clinic. Non-Hodgkin’s lymphoma. www.mayoclinic.org/diseases-conditions/non-hodgkins-lymphoma/symptoms-causes/syc-20375680. Accessed December 5, 2017. 3. National Cancer Institute. SEER cancer stat facts: non-Hodgkin lymphoma. https://seer.cancer.gov/statfacts/html/nhl.html. Accessed December 6, 2017. 4. Neelapu SS, Locke FL, Bartlett NL, et al. Axicabtagene ciloleucel CAR T-cell therapy in refractory large B-cell lymphoma. N Engl J Med. 2017;377:2531-2544. 5. Crump M, Neelapu SS, Farooq U, et al. Outcomes in refractory diffuse large B-cell lymphoma: results from the international SCHOLAR-1 study. Blood. 2017;130:1800-1808. 6. US Food and Drug Administration. FDA approves CAR-T cell therapy to treat adults with certain types of large B-cell lymphoma: Yescarta is the second gene therapy product approved in the U.S. October 18, 2017. www.fda.gov/NewsEvents/Newsroom/PressAnnouncements/ucm581216.htm. Accessed December 4, 2017. 7. Gilead. Kite’s Yescarta (axicabtagene ciloleucel) becomes first CAR T therapy approved by the FDA for the treatment of adult patients with relapsed or refractory large B-cell lymphoma after two or more lines of systemic therapy. October 18, 2017. www.gilead.com/news/press-releases/2017/10/kites-yescarta-axicabtagene-ciloleucel-becomes-first-car-t-therapy-approved-by-the-fda-for-the-treatment-of-adult-patients-with-relapsed-or-refractory-large-bcell-lymphoma-after-two-or-more-lines-of-systemic-therapy. Accessed December 12, 2017. 8. Yescarta (axicabtagene ciloleucel) suspension for intravenous infusion [prescribing information]. Santa Monica, CA: Kite Pharma; October 2017.